The LA Auto Show is huge. Seriously the physical space that the show takes up is just massive. As such there is usually plenty of room for all the OEMs to share space in the Los Angeles Convention Center’s two largest halls. However, Porsche is different. They choose to not be mixed in with everyone else. Instead, every year they completely take over an entire (albeit smaller) hall to themselves and completely transform it into a one-off Porsche exhibit. Even though they use the same space every year, the design is never repeated. Each year features a completely different interior design. Because of this, Porsche is always my favorite OEM to visit, just so I can see what they did differently. This year when visitors walk into Petree hall the first thing they will be greeted by is a classic Porsche 904 Carrera GTS that has been rarely seen in public. In fact, it was my first time seeing a 904 in person, ever. It was quite an opener! The marquee of the exhibit this year is the debut of the new Cayman and Cayman S. Many consider the Cayman to pretty much be a Boxter with a roof and to some extent it is, but it is also Porsche’s main solider in the battle against the likes of Lotus and other light weight small sports cars. 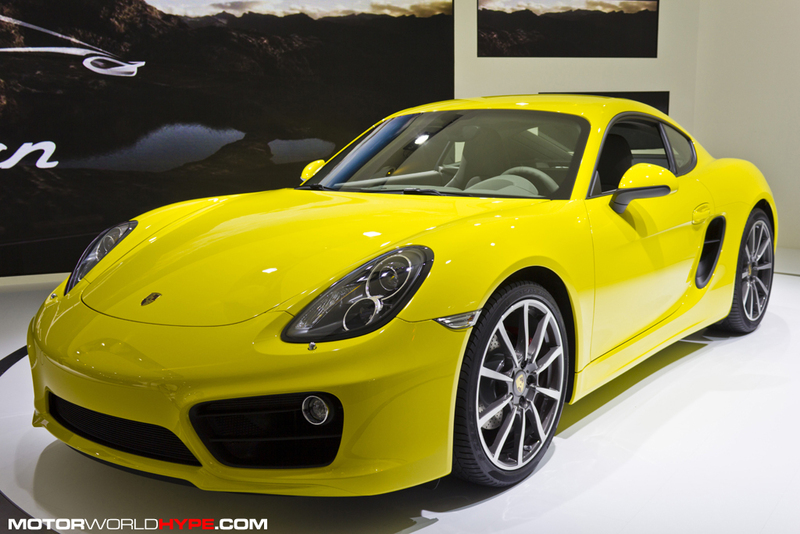 The new Cayman is lighter and has a slightly longer wheel base than the previous model. Its stying has been toned down a bit (in my opinion anyway) but not so much that it looks boring. The new Cayman will come equipped with a 275HP 2.7 liter flat six out back while the Cayman S will have a larger 3.4 liter engine making 325HP. Having 275 horses pushing you is not bad but I think its clear that the Cayman S is going to be the one to beat when it comes to comparison tests. Both trims are offered at reasonable MSRPs with the Cayman starting at $52,600 while the Cayman S comes in at just $63,800 which puts it at the sweet spot for those who want a Porsche but don’t quite have 911 money. It also comes in at much less than a Lotus Evora S (which range around the $80-$90k area) while only being short 10 horses of the Evora S’ total. Lotus is in some serious trouble! Besides the new Cayman Porsche also showed off the new “Platinum Edition” Panamera which comes in a limited edition color way and features a few cushy extras such as Porsche Communication Management and heated front seats. Finally Paid a short visit to the Porsche “store” inside of the exhibit to check out some of their cool, incredibly expensive goodies. Once again Porsche brought back their carbon fiber, disc brake-equipped bicycle. I did not catch a glimpse at the price tag but I am sure it is over $2k or more! One of my favorite items were tiny magnets shaped like classic 911 coupes. You could stick them on a fridge or on a metallic classic Porsche poster, which was also on display. There was of course a few racks full of Porsche apparel like shirts, jackets, hats, etc. All of which looked awesome, but just a bit (meaning a lot) out of my price range! Either way the Porsche exhibit is always fun and is a must-see this year. Check out our Facebook Page for a full gallery from the exhibit.